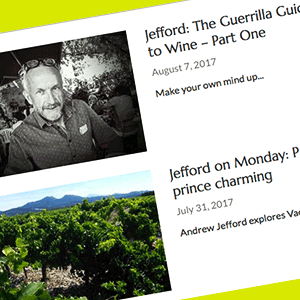 Andrew now blogs each week for Decanter magazine as ‘Jefford on Monday’. Please visit the site to read his weekly column and browse through all his previous posts. In addition to his work for Decanter, Andrew has written a large collection of other blogs and articles that were previously listed on this website. Some of the highlights will be re-posted on this site over the coming months and new comments will be welcome. Please use the contact form on this site if you have any questions about pieces Andrew has written that are no longer available.